I have been a vegetarian for close to two decades. Although I started eating vegetarian out of respect for animals, over the years I naturally began to explore other issues as well. I collected books and clippings about healthy eating, green living and protecting the environment. And I began to search out organic foods and chemical-free cleaning products. This became particularly important to me when I was pregnant with my first child over 12 years ago. I wanted to reduce my baby's exposure to toxins that could harm him. I have developed a pretty good understanding of natural and organic living over the years and I have sampled a great number of products. I want to share some of my findings with you through Woman in Real Life's new "Products We Love" series. "Products We Love" will feature family- and earth-friendly, healthy foods and household products that have been tested and enjoyed by my family. I was going to start the series in 2014, but I really wanted to share this first wonderful item with you in time for the holidays. Trust me, you will want to do your holiday cleaning with these products. I first spotted C is for Clean all-purpose cleaner at the Delicious Food Show in Toronto. I was immediately drawn to the beautiful packaging. The simple design of the labels combined with the pretty touches of purple, pink and orange appealed to me. Then I read the descriptions of the three available scents - sweet orange and lemongrass, lavender and vanilla, pink grapefruit - they sounded edible and I just had to smell them! I have a pretty sensitive nose and I have developed an aversion to toxic scents. In fact, if I'm passing through the cleaning or laundry aisles at a supermarket I sometimes feel lightheaded and weak. 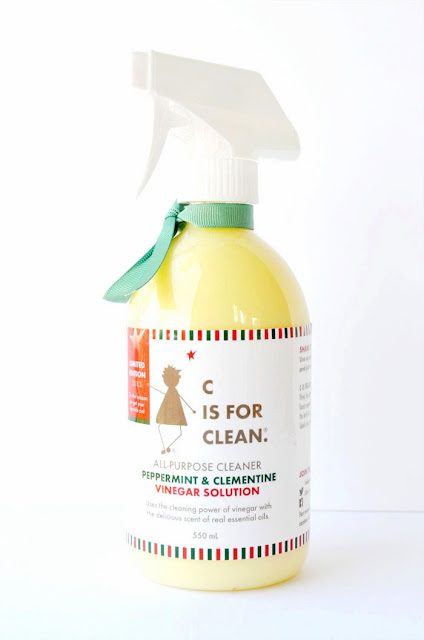 C is for Clean products are not only wonderfully fragrant, they smell completely natural, just like you are cutting up fruit or picking lavender. That makes sense because C is for Clean products are scented with essential oils from real plants. The products contain no toxins, dyes, petroleum by-products or nasty chemicals at all. C is for Clean is going back to basics, combining age-old cleaning recipes grandma used to make with modern essential oils. The products use high-quality distilled white vinegar as the active ingredient, along with real essential oils. There are no strange or unrecognizable ingredients on the label. C is for Clean founder Maggie McKeown, a trained chef and recipe creator, recommends using her hand-made cleaners anywhere you need some extra cleaning power - just shake, spray and wipe on your counters and tables, ﬂoors, high chairs, toys, car seats, microwaves, lunch bags, fridges, mirrors, bath tubs and even your kitchen sink to keep your home sparkling clean and smelling delightful. I have become completely addicted to using C is for Clean products. I'm not kidding. While I'm not a big fan of housecleaning, I enjoy using this all-purpose cleaner so much that I even use it while I'm watching TV. I spray it on anything in sight - walls, light switches, the fireplace trim, the mirror above the fireplace, the coffee table. I have also used it on my pleather winter boots, kitchen cupboards, the stovetop, my stainless steel fridge, toilets and sinks. I travel up and down staircases using it to remove fingerprints from walls, light switches and door knobs. It smells amazing and it cleans brilliantly. Maggie has developed a limited edition peppermint and clementine all-purpose cleaner in time for the holidays. It works as effectively as all of the other cleaners and will fill your home with the scent of Christmas as you clean - no candles needed! It's not available on the C is for Clean website, but you can call 416-702-4042 to order. They are selling like hot cakes at the One of a Kind Show right now. They would make a fabulous hostess gift too! 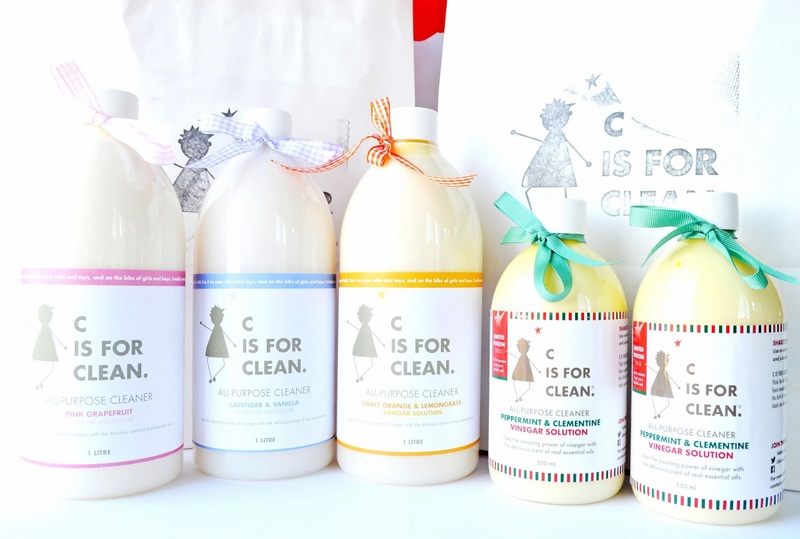 Enter to Win a $75 Gift Basket from C is for Clean! One lucky Woman in Real Life Canadian reader will win a $75 gift basket including C is for Clean products and a few other goodies. Enter to win using the rafflecopter below until December 30th. *This post is sponsored. All opinions are authentic. Thank you for supporting the awesome companies that partner with Woman in Real Life! Oh! I love this product find! I love that it's Canadian and it has such pretty packaging, but of course it's what inside that counts! I, too, am very careful about what I bring into the house for chemicals and if I could find this on a store shelf, I would go out and buy it today! This is an AWESOME new find! Thank you so much for sharing! If you have any experience with natural/organic shampoo I'd love to hear it. I have recently tried "no poo" but so far it's been a huge bust. I'm pretty sure there is a middle line between regular shampoo and No Poo! Peppermint and Clementine... I would be in heaven smelling that all day!! I'ld like to try the all-purpose cleaner in grassy scent. The Crisp and Citrusy line sounds lovely. I've developed a lot of chemical allergies with age. This would be a great win ! The packaging is eye catching! All of the scents sound heavenly! I usually make my own AP cleaner so all the scents sound like an improvement over mine. lol But if I had to pick one, I would go with sweet orange and lemongrass. I would like the Pink Grapefruit All Purpose Cleaner. I think sweet orange and lemongrass for me. I usually like lavender, but that's too relaxing. My cleaning solution should be peppy! I'd also be down with the pink grapefruit - it's so tangy and has zip! Pink Grapefruit All Purpose Cleaner would be nice! I like the Sweet Orange and Lemongrass all purpose cleaner.....love that it's Canadian!! This sounds amazing, I love that it is Canadian and anything that smells like orange is a hit with me. Plus it actually makes you want to clean, I need this in my life! Thanks for sharing another great product. I love orange scented products too Pia! And I am still spraying away with this stuff. Which is unusual for me. ;) Have a great weekend! I love the lemongrass all purpose cleaner! The Sweet Orange and Lemongrass All Purpose cleaner appeals to me most. Lavender and vanilla sounds like it would make cleaning very zen. Lavender cleaner would be my choice! I just HAVE to try the new Peppermint Clementine scent!!!! Sweet Orange and Lemongrass all purpose cleaner! Love that this is a Canadian product! Peppermint & Clementine sounds lovely. 2 great scents combined. 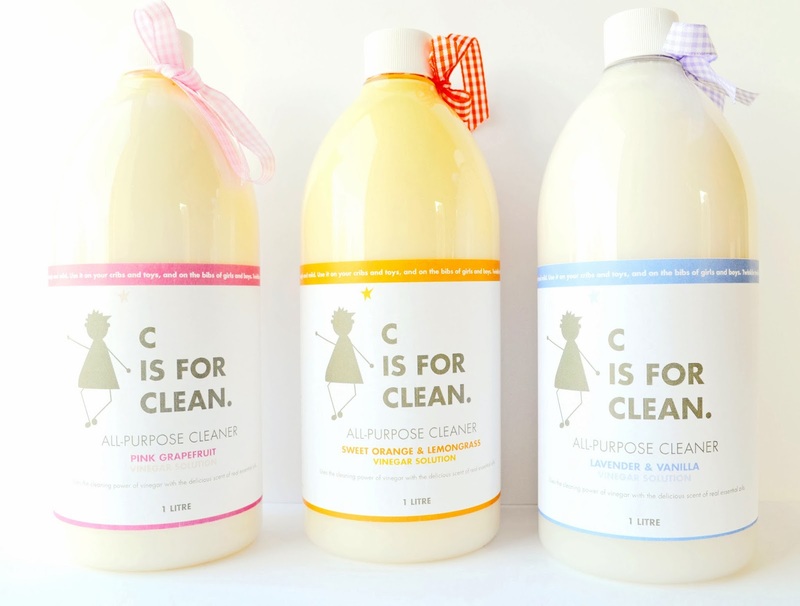 I'd love to try the Lavender and Vanilla all purpose cleaner. Sweet Orange and Lemongrass All-Purpose Cleaner would be my pick. Pink Grapefruit all purpose cleaner! The sweet orange and lemongrass would be my choice. I love the smell of pink grapefruit! I would most like to try the sweet orange and lemongrass all purpose cleaner. The all purpose cleaner in lavender and vanilla! The Pink Grapefruit all purpose cleaner. The Lavender & Vanilla cleaner sounds amazing! I would love to try these cleaning products. I like anything that steers clear of toxins and harsh chemicals. Thanks for sharing! We are trying to use all natural cleaners, soaps, hygiene products in our home , I have to admit I miss the beautiful fruit smells. I am so excited to have found this all purpose cleaner that cleans safely and smells wonderful. The Lavender and Vanilla sounds yummy! Peppermint and Clementine sounds so good to try around the house! I like the lavender and vanilla all purpose cleaner. I would love the grassy scent of cleaner. Sweet Orange and Lemongrass AP cleaner - yummy! I love the scent of lavender so the lavender and vanilla all purpose cleaner would most appeal to me. Thanks for the giveaway and Happy Holidays!!! the lavendar and vanilla cleaner sounds like it could be my favourite combination! MMM - the Pink Grapefruit. I like eucalyptus in a cleaner....but pine works too. I love citrus scents so pink grapefruit would be my first choice. I love the pink grapefruit all purpose cleaner. I like the all purpose cleaner in orange and lemongrass. I would like the lavender and vanilla all-purpose cleaner. The Lavender & Vanilla Cleaner sounds nice to me! The sweet orange and lemongrass all purpose cleaner would be awesome. I love the smell of lemongrass. The pink grapefruit all purpose cleaner sounds amazing! I think I'd like the pink grapefruit all-purpose cleaner. I was introduced to CisforClean at the ONE OF A KIND CRAFT SHOW in Toronto. I bought 3 bottles of cleaner and I love every one. My fav is perhaps the Lavender. I'd love the lavender and vanilla cleaner! The orange and lemongrass vinegar solution also sounds fun! The all purpose cleaner :) - love lavender! The lavender and vanilla all purpose cleaner! I am so pleased to see that they have Grapefruit scented products like the all purpose spray! I like the pink grapefruit all purpose cleaner! The sweet orange and lemongrass one sounds great. I'd like the pink grapefruit cleaner! I like the pink grapefruit. I had some dish soap that had pink grapefruit. I'd like to try the Lavender and Vanilla all purpose cleaner. the pink grapefruit but it all looks awesome except the lavender. i'm severely allergic to lavender. I have never heard of this product line before. Thanks for introducing it to me! I think the Pink Grapefruit All Purpose Cleaner would suit me. sweet orange and lemon grass! The Pink Grapefruit All Purpose Cleaner sounds nice. id love the orange & lemongrass all purpose cleaner! OI think that I would like the sweet orange and lemongrass. The Lavender and Vanilla all-purpose cleaner sounds great! The sweet orange and lemon grass all purpose cleaner sounds fantastic! I'd like to try the Pink Grapefruit All Purpose Cleaner!